The Scotch Whisky Association has won a six-year battle to stop a German distillery from using the term ‘Glen’ on its bottles, calling it “misleading” to the consumer and implies a Scottish origin and infringes upon its protected status. The SWA launched legal action against German distillery Waldhorn in 2013, specifically against its single malt Glen Buchenbach. 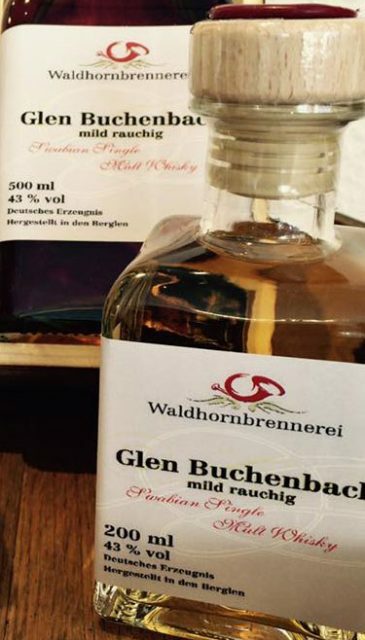 The SWA launched legal action against German distillery Waldhorn in Berglen, near Stuttgart, in 2013, specifically against its single malt Glen Buchenbach. The German producer, from Baden-Württemberg in the south of the country, makes a number of products including gin and traditional German ‘brand’ of various types. It also makes a ‘whisky’ – with the Scottish spelling – named after the nearby Buchenbachtal in Swabia. ‘Tal’ in German means ‘valley’ and, as the distillery explains on its website, ‘glen’ is the Gaelic word for valley which is why the whisky has been named ‘Glen Buchenbach Swabian ’. The SWA argued that the product could confuse consumers and “mislead them as to the true origin of the whisky”. Previously, an EU court said it would continue to use the name, after advocate general, Henrik Saugmansgaard Øe, ruled that ‘glen’, while Gaelic in origin, did not evoke Scotland to the point that EU law had been broken, pointing out that many Irish and Canadian whiskies also use the term on their labels. However now a court in Hamburg has ruled in the SWA’s favour, ordering the distillery to change the name of the whisky as it breached the geographical indication of Scotch. The inclusion of the word “glen” in the branding could make consumers believe it was produced in Scotland, the court ruled. Alan Park, SWA’s director of legal affairs, said: “The SWA has consistently taken action in our global markets to prevent the use of Scottish indications of origin on whisky which is not Scotch Whisky. This is vital to protecting Scotland’s national drink and is a deterrent to those who seek to take advantage of the quality reputation of Scotch Whisky and potentially mislead consumers. “Courts across many jurisdictions have ruled that names, such as “Highland” and “Glen”, and images, such as bagpipers, are so strongly associated with Scotland and Scotch Whisky that their use on whisky of another origin is misleading. There was a similar case in 2009 when the SWA challenged a Canadian distillery over a whisky called ‘Glen Breton’. In that instance a Canadian court ruled that the name did not create the impression the product was from Scotland. Pointless, surely. Only the most cretinous consumer would think that this is a Scotch Whisky, surely? If you look at the rest of the label it actually states SWABIAN whisky! Also Buchenbach does not sound very Scottish.